A terminally ill boy has been inundated with videos of animals from well-wishers after a social media post about him was seen around the world. Harvey Hawkins, 11, is being given end of life care at Noah’s Ark Children’s Hospital for Wales in Cardiff. A Facebook post about him meeting the Wales rugby team mentioned his love of dogs and the videos started coming in. Harvey, from Merthyr Tydfil, has suffered from a series of complex conditions since birth. He met the Wales team at the Principality Stadium last week, just before their Six Nations Grand Slam victory, and Noah’s Ark Charity – which arranged the meeting – posted about it on social media. Harvey’s cousin, who lives in Canada, shared the post and mentioned the little boy’s love of dogs – prompting the influx of more than 1,000 videos. His mother, Jamie-Louise Wallace, said: “We have been overwhelmed with the response and the number of videos. “We have had videos of people’s dogs singing or saying ‘hello’. We had one dog saying ‘I love you’, and another dog playing the piano. “It’s not just dogs. There are videos of turtles, cats, chickens, horses, snakes and fish. Messages have come in from Alaska, Australia, and Mexico. Harvey has about 30 different health conditions and, in January, was diagnosed with complete gut failure and a condition called intestinal pseudo-obstruction. He can no longer be fed, and the family said doctors have done all they can. Harvey was also recently visited by a therapy dog called Nico. 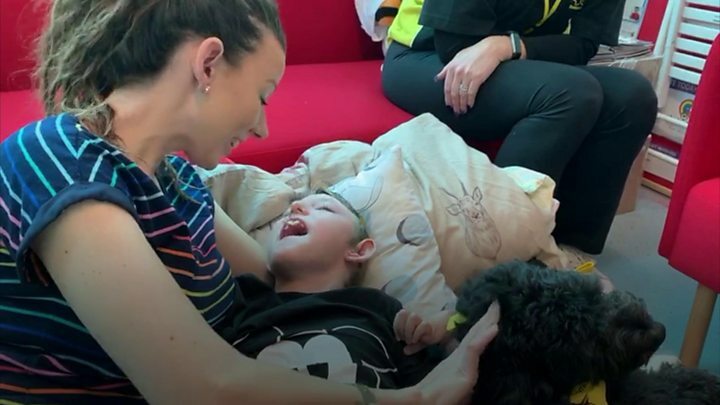 His family said they want other children to be able to benefit from the same experience, with the creation of an animal therapy room on the ward. “All of Harvey’s discomfort and agitation seemed to melt away when he stroked Nico, something which is only usually eased with medication,” Jamie-Louise said. Bethan Simmonds, from the charity, said: “As much as we all want to, it isn’t always possible to make everyone better.